Everyone’s favourite square-headed superhero is back! No, not Henry Cavill – it’s The Lego Batman Movie. 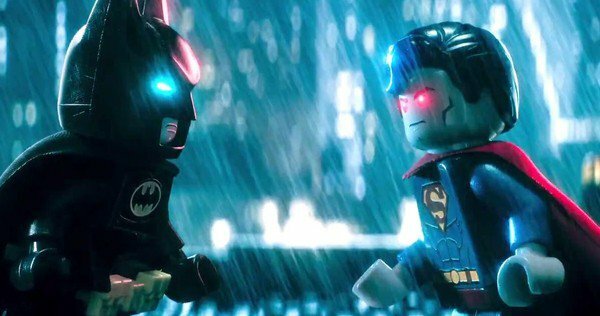 In this Lego Movie spin-off, Bruce “The Greatest Orphan of All Time” Wayne (Will Arnett) goes up against more villains than you can shake a batarang at. Half superhero parody and half pop cultural acid trip, this is the funniest Batman movie since Batman & Robin. It’s bat-fun, bat-cute and batshit crazy. Although less Lego-ey than its predecessor, the ingenious design and colourful animation continue to whisk us along at head-spinning speed. It strikes the same smart balance between irony and sincerity, gleefully skewering the Dark Knight in all his incarnations – plus an array of other targets, ranging from Iron Man to Jerry Maguire. Jokes rain down on recent DC offerings like a tonne of Lego, because even characters without noses can tell that Suicide Squad stinks. Arnett’s Caped Crusader is bat-fantastic, most resembling the arrogant cartoon Batman who hangs out at How It Should Have Ended‘s Superhero Café with his “because I’m Batman” catchphrase. He’s assisted by Alfred (Ralph Fiennes), Commissioner Barbara Gordon (Rosario Dawson) and Robin (Michael Cera) – a Bluth family reunion that will please fellow Arrested Development fans. Billy Dee Williams also reprises his role as Two-Face for the first time in 28 years. Now that’s Justice. Thanks to a proper Batman movie plot, some interesting exploration of the character and a constant barrage of laugh-out-loud parody, you’ll be wearing a smiley head throughout. It’s refreshing to have Zack Synder Lego of his stranglehold on the franchise (however briefly), while Arnett might just be the best Batman ever put to screen. Ben Affleck must be bricking it.